Architectural investigator at work. Photo: Courtesy, Valentine Museum. If you have ever felt a sense of excitement and mystery going inside an old building—whether occupied or vacant—it is probably because its materials and features resonate with the spirit of past people and events. Yet excitement about the unknown is heightened when a historic structure is examined architecturally, and its evolution over time emerges with increasing clarity to reveal the lives of its occupants. Architectural investigation is the critical first step in planning an appropriate treatment-understanding how a building has changed over time and assessing levels of deterioration. Whether as a home owner making sympathetic repairs, a craftsman or contractor replacing damaged or missing features, or a conservator reconstituting wood or restoring decorative finishes, some type of investigative skill was used to recognize and solve an architectural question or explain a difficult aspect of the work itself. To date, very little has been written for the layman on the subject of architectural investigation. This Preservation Brief thus addresses the often complex investigative process in broad, easy-to-understand terminology. The logical sequence of planning, investigation and analysis presented in this Brief is applicable to all buildings, geographic locations, periods, and construction types. It is neither a "how to" nor an exhaustive study on techniques or methodologies; rather, it serves to underscore the need for meticulous planning prior to work on our irreplaceable cultural resources. Both the purpose and scope of investigation need to be determined before formulating a particular approach. For example, investigation strictly for research purposes could produce information for an architectural survey or for an historic designation application at the local, state or national level. 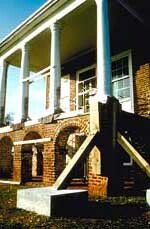 Within the framework of The Secretary of the Interior's Standards for the Treatment of Historic Properties, investigation is crucial for "identifying, retaining, and preserving the form and detailing of those architectural materials and features that are important in defining the historic character" of a property, whether for repair or replacement. A rehabilitation project, for instance, might require an investigation to determine the historic configuration of interior spaces prior to partitioning a room to meet a compatible new use. Investigation for preservation work can entail more detailed information about an entire building, such as determining the physical sequence of construction to aid in interpretation. Investigation for a restoration project must be even more comprehensive in order to re-capture the exact form, features, finishes, and detailing of every component of the building. Whether investigation will be undertaken by professionals-architects, conservators, historians-or by interested homeowners, the process is essentially comprised of a preliminary four-step procedure: historical research, documentation, inventory, and stabilization. Primary historical research of an old building generally encompasses written, visual and oral resources that can provide valuable site-specific information. Written resources usually include letters, legal transactions, account books, insurance policies, institutional papers, and diaries. Visual resources consist of drawings, maps, plats, paintings and photographs. Oral resources are people's remembrances of the past. Secondary resources, comprised of research or history already compiled and written about a subject, are also important for providing a broad contextual setting for a project. Historical research should be conducted well in advance of physical investigation. This allows time for important written, visual, and oral information to be located, transcribed, organized, studied and used for planning the actual work. An inventory of animal nests found within hidden spaces may yield unexpected evidence about food, decorative arts, and cultural or social traditions of everyday life. Photo: Travis C. McDonald, Jr.
A thorough scholarly study of a building's history provides a responsible framework for the physical investigation; in fact, the importance of the link between written historical research and structural investigation cannot be overestimated. For example, the historical research of a building through deed records may merely determine the sequence of owners. This, in turn, aids the investigation of the building by establishing a chronology and identifying the changes each occupant made to the building. A letter may indicate that an occupant painted the building in a certain year; the courthouse files contain the occupant's name; paint analysis of the building will yield the actual color. Two-dimensional documentary research and three-dimensional physical investigation go hand-in-hand in analyzing historic structures. The quality and success of any restoration project is founded upon the initial research. A building should be documented prior to any inventory, stabilization or investigative work in order to record crucial material evidence. A simple, comprehensive method is to take 35 mm photographs of every wall elevation (interior and exterior), as well as general views, and typical and unusual details. The systematic numbering of rooms, windows and doors on the floor plan will help organize this task and also be useful for labeling the photographs. Video coverage with annotated sound may supplement still photographs. Additional methods of documentation include written descriptions, sketches, and measured drawings. Significant structures, such as individually listed National Register properties or National Historic Landmarks, benefit from professional photographic documentation and accurate measured drawings. Professionals frequently use The Secretary of the Interior's Standards and Guidelines for Architectural and Engineering Documentation: HABS/HAER Standards. It should be remembered that the documents created during investigation might play an unforeseen role in future treatment and interpretation. Documentation is particularly valuable when a feature will be removed or altered. The historic building and its components should be carefully inventoried prior to taking any action; premature clean-up of a structure or site can be a mistake. A careful look at all spaces in and around a building may reveal loose architectural artifacts, fragile evidence or clues to historic landscape features. This thorough observation includes materials and features which have fallen off due to deterioration, fragments removed and stored in basements, attics or outbuildings, and even materials which have seemingly been discarded. In the beginning, anything that seems even remotely meaningful should be saved. A common mistake is to presume to know the value of artifacts or features at the beginning of a project. Even if the period of significance or interpretation is known from the beginning, evidence from all periods should be protected. Documentation for future study or use includes labeling and, if possible, photographing prior to storage in a secure place. In many cases, emergency stabilization is necessary to ensure that a structure does not continue to deteriorate prior to a final treatment or to ensure the safety of current occupants, investigators, or visitors. Although severe cases might call for structural remedies, in more common situations, preliminary stabilization would be undertaken on a maintenance level. Such work could involve installing a temporary roof covering to keep water out; diverting water away from foundation walls; removing plants that hold water too close to the walls; or securing a structure against intruding insects, animals and vandals. 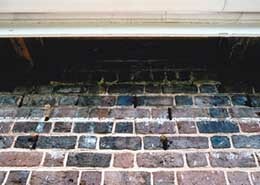 An old building may require temporary remedial work on exterior surfaces such as reversible caulking or an impermanent, distinguishable mortar. Or if paint analysis is contemplated in the future, deteriorated paint can be protected without heavy scraping by applying a recognizable "memory" layer over all the historic layers. Stabilization adds to the cost of any project, but human safety and the protection of historical evidence are well worth the extra money. An investigator must have the skill and ability to closely observe and analyze the materials with a broad understanding of historic construction practices and technologies. Photo: Travis C. McDonald, Jr. The essential skill needed for any level of investigation is the ability to observe closely and to analyze. These qualities are ideally combined with a hands-on familiarity of historic buildings-and an open mind! Next, whether acquired in a university or in a practical setting, an investigator should have a good general knowledge of history, building design history and, most important, understand both construction and finish technologies. But it is not enough to know architectural style and building technology from a national viewpoint; the investigator needs to understand regional and local differences as well. While investigative skills are transferable between regions and chronological periods, investigators must be familiar with the peculiarities of any given building type and geographical area. Investigation frequently identifies urgent needs of stabilization. Supplemental support, such as temporary shoring, may be required to prevent collapse. Photo: Travis C. McDonald, Jr. Architectural survey and comparative fieldwork provides a crucial database for studying regional variations in historic buildings. For example, construction practices can reflect shared experiences of widely diverse backgrounds and traditions within a small geographical area. Contemporary construction practice in an urban area might vary dramatically from that of rural areas in the same region. Neighbors or builders within the same small geographical area often practice different techniques of constructing similar types of structures contemporaneously. Reliable dating clues for a certain brick bond used in one state might be unreliable for the same period in a different state. Regional variation holds true for building materials as well as construction. Finally, even beyond regional and local variation, an investigator needs to understand that each building has its own unique history of construction and change over time. Form, features, materials and detailing often varied according to the tastes and finances of both builder and supplier; construction quality and design were also inconsistent, as they are today. Because architectural investigation requires a wide range of knowledge and many different skills, various people are likely to interact on the same project. While homeowners frequently execute small-scale projects, more complex projects might be directed by a craftsman, an architect or a conservator. For large-scale projects, a team approach may need to be adopted, consisting of professionals interacting with additional consultants. Consulting specialists may include architectural historians, architectural conservators, craftsmen, historic finish analysts, historians, archeologists, architects, curators, and many others. The scope and needs of a specific project dictate the skills of key players. Architectural investigation often includes the related fields of landscape and archeological investigation. Landscape survey or analysis by horticulturists and landscape architects identify pre-existing features or plantings or those designed as separate or complementary parts of the site. Both above and below-ground archeology contribute information about missing or altered buildings, construction techniques, evidence of lifestyle and material culture, and about the evolution of the historic landscape itself. Research prior to investigation may have indicated the architect, builder or a building's date of construction. In the absence of such information, architectural histories and field guides to architectural style can help identify a structure's age through its form and style. Any preliminary date, however, has to be corroborated with other physical or documentary facts. Dates given for stylistic periods are general and tend to be somewhat arbitrary, with numerous local variations. Overall form and style can also be misleading due to subsequent additions and alterations. When the basic form seems in conflict with the details, it may indicate a transition between styles or that a style was simply upgraded through new work. The architectural investigation usually determines original construction details, the chronology of later alterations, and the physical condition of a structure. Most structures over fifty years old have been altered, even if only by natural forces. People living in a house or using a building for any length of time leave some physical record of their time there, however subtle. A longer period of occupancy generally counts for greater physical change. Buildings acquire a "historic character" as changes are made over time. Changes to architectural form over time are generally attributable to material durability, improvement in convenience systems, and aesthetics. First, the durability of building materials is affected by weathering, temperature and humidity, by disasters such as storms, floods or fire, or by air pollution from automobiles and industry. Second, changes in architectural form have always been made for convenience' sake-fueled by technological innovations-as people embrace better lighting, plumbing, heating, sanitation, and communication. People alter living spaces to meet changing family needs. Finally, people make changes to architectural form, features, and detailing to conform to current taste and style. Although brick or wood frame buildings are the most common in this country, similar sets of characteristics and questions can be established for examining log, adobe, steel, or any other material. Careful examination of the masonry reveals different periods of construction and repair through the composition and detailing of bricks and mortar. Depending on location, the vertical open joints may indicate the location of nailing blocks for decorative trim or weeps for drainage. Photo: Travis C. McDonald, Jr. Studying historic brickwork can provide important information about methods of production and construction. For example, the color, size, shape and texture of brick reveals whether it was hand molded and traditionally fired in a clamp with hardwoods, or whether it was machine molded and fired in a kiln using modern fuels. Similarly, the principal component part of masonry mortar, the lime or cement, reveals whether it was produced in a traditional or modern manner. Certain questions need to be asked during investigation. Is the mortar made with a natural or a Portland cement? If a natural cement, did it come from an oyster shell or a limestone source? Is it hydrated or hydraulic? As a construction unit, brick and mortar further reveal something about the time, place and human variables of construction, such as the type of bond, special brick shapes, decorative uses of glazed or rubbed brick, coatings and finishes, and different joints, striking and tooling. Does the bond conform with neighboring or regional buildings of the same period? Does the pattern of "make up" bricks in a Flemish Bond indicate the number of different bricklayers? What is the method of attaching wood trim to the masonry? The same types of questions related to production and construction characteristics can be applied to all types of masonry work, including stone, concrete, terra cotta, adobe and coquina construction. A complete survey undertaken during "surface mapping" can outline the materials and construction practices for the various periods of a structure, distinguishing the original work as well as the additions, alterations, and replacements. Analyzing the nail technology can help establish the period of construction and provide other important information. Photo: Travis C. McDonald, Jr.
Buildings constructed with wood have a very different set of characteristics, requiring a different line of questioning. Is the wooden structural system log, timber frame, or balloon frame construction? Evidence seen on the wood surface indicates whether production was by ax, adze, pit saw, mill saw (sash or circular), or band saw. What are the varying dimensions of the lumber used? Finished parts can be sawn, gouged, carved, or planed (by hand or by machine). 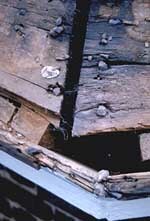 Were they fastened by notching, mortise and tenon, pegs, or nailing? If nails were used, were they wrought by hand, machine cut with wrought heads, entirely machine cut, or machine wire nails? For much of the nineteenth century the manufacture of nails underwent a series of changes and improvements that are dateable, allowing nails to be used as a tool in establishing periods of construction and alteration. Regardless of region or era, the method of framing, joining and finishing a wooden structure will divulge something about the original construction, its alterations, and the practices of its builders. Finally, does some of the wood appear to be re-used or re-cycled? Re-used and reproduction materials used in early restoration projects have confused many investigators. When no identification record was kept, it can be a problem distinguishing between materials original to the house and later replacement materials. In many cases, new materials or coverings are placed directly over existing exterior features, preserving the original materials underneath. Here, the removal of a modern shingle roof and its underlayment revealed an historic standing seam metal roof. Photo: Courtesy, Phillips and Opperman, P.A. Exterior features are especially prone to alteration due to weathering and lack of maintenance. Even in the best preserved structures, the exterior often consists of replaced or repaired roofing parts. Roof coverings typically last no more than fifty years. Are several generation of roof coverings still in place? Can the layers be identified? 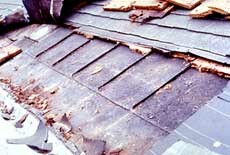 If earlier coverings were removed, the sheathing boards frequently provide clues to the type of covering as well as missing roof features. Dormers, cupolas, finials, cresting, weathervanes, gutters, lightning rods, skylights, balustrades, parapets and platforms come and go as taste, function and maintenance dictate. The roof pitch itself can be a clue to stylistic dating and is unlikely to change unless the entire roof has been rebuilt. Chimneys might hold clues to original roof pitch, flashings, and roof feature attachments. Is it possible to look down a chimney and count the number of flues? This practice has occasionally turned up a missing fireplace. In many parts of the country, nineteenth-century roof coverings evolved from wooden shingles or slate shingles, to metal shingles, to sheet metal, and still later in the twentieth century, to asphaltic or asbestos shingles. Clay tiles can be found covering roofs in seventeenth and eighteenth-century settlements of the east coast as well as western and southwestern Spanish settlements from the same period. Beyond the mid-nineteenth century, and into the twentieth, the range and choice of roof coverings greatly expanded. In addition to production and construction clues, floors reveal other information about the interior, such as circulation patterns, furniture placement, the use of carpets, floor cloths, and applied floor finishes. Is there a pattern of tack holes? Tacks or tack holes often indicate the position and even the type of a floor covering. A thorough understanding of the seasonal uses of floor coverings and the technological history of their manufacture provide the background for identifying this type of evidence. Destructive investigation can be limited to small areas where evidence can be predicted, such as walls being re-built in a different location. Photo: Travis C. McDonald, Jr. Walls and their associated trim, both outside and inside, hold many clues to the building's construction and changes made over time. The overall style of moldings, trim and finishes, and their hierarchical relationship, can help explain original construction as well as room usage and social interaction between rooms. Holes, scars, patches, nails, nail holes, screws and other hardware indicate former attachments. Are there "ghosts," or shadow outlines of missing features, or trim attachments such as bases, chair rails, door and window casings, entablatures, cornices, mantels and shelves? Ghosts can be formed by paint, plaster, stucco, wear, weathering or dirt. Interior walls from the eighteenth and early nineteenth-century were traditionally plastered after grounds or finished trim was in place, leaving an absence of plaster on the wall behind them. Evidence of attachments on window casings can also be helpful in understanding certain interior changes. Other clues to look for include the installation of re-used material brought into a house or moved about within a house; worker's or occupant's graffiti, especially on the back of trim; and hidden finishes or wallpaper stuck in crevices or underneath pieces of trim. Stylistic upgrading often resulted in the re-use of outdated trim for blocking or shims. Unexpected discoveries are particularly rewarding. Investigators frequently tell stories about clues that were uncovered from architectural fragments carried off by rats and later found, or left by workers in attics, between walls and under floors. Attics and basements have been known as collection points for out-of-date, out-of-style and cast-off pieces such as mechanical systems, furnishings, family records and architectural fragments. These and other out-of-the-way places of a structure provide an excellent opportunity for non-destructive investigation. Not only are these areas where structural and framing members might be exposed to view, they are also areas which may have escaped the frequent alteration campaigns that occur in the more lived-in parts of a building. 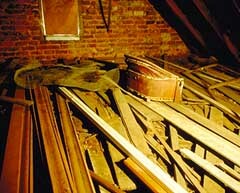 Discarded items are routinely stored within attics, then forgotten only to be discovered during a later investigation. Seemingly worthless debris may help answer many questions. Photo: Travis C. McDonald, Jr. If a building has been raised or lowered in height, evidence of change would be found in the attic as well as on the exterior. Evidence of additions might also be detected in both the attic and the basement. Attics frequently provide a "top-side" view at the ceiling below, revealing its material, manner of production and method of attachment. A "bottom-side" view of the roof sheathing or roof covering can be seen from the attic as well. Basements generally relate more to human service functions in earlier buildings and to mechanical services in more recent eras. For example, a cellar of an urban 1812 house disclosed the following information during an investigation: first period bell system, identification of a servant's hall, hidden fireplace, displacement of the service stairs, identification of a servants' quarters, an 1850s furnace system, 1850s gas and plumbing systems, relocation of the kitchen in 1870, early use of 1890s concrete floor slabs and finally, twentieth century utility systems. While the earliest era had been established as the interpretation period, evidence from all periods was documented in order to understand and interpret how the house evolved or changed over time. Systems of utility and convenience bear close scrutiny during investigation. All historic buildings inhabited and used by people reveal some association, at the very minimum, with the necessities of lighting, climate control, water, food preparation, and waste removal. Later installations in a building may include communication, hygiene, food storage, security, and lightning protection systems. Other systems, such as transportation, are related to more specific functions of commercial or public structures. Although research into the social uses of rooms and their furnishings has borne many new studies, parallel research into how people actually carried out the most mundane tasks of everyday life has been fairly neglected. Utility and convenience systems are most prone to alteration and upgrading and, at the same time, less apt to be preserved, documented or re-used. Understanding the history or use of a building, and the history of systems technology can help predict the physical evidence that might be found, and what it will look like after it is found. Architectural investigation can range from a simple one hour walk-through to a month long or even multi-year project-and varies from looking at surfaces to professional sub-surface examination and laboratory work. All projects should begin with the simplest, non-destructive processes and proceed as necessary. The sequence of investigation starts with reconnaissance and progresses to surface examination and mapping, sub-surface non-destructive testing, and various degrees of sub-surface destructive testing. An initial reconnaissance trip through a structure-or visual overview-provides the most limited type of investigation. But experienced investigators accustomed to observation and analysis can resolve many questions in a two-to-four hour preliminary site visit. They may be able to determine the consistency of the building's original form and details as well as major changes made over time. Raking light is used to show irregularities on flat surfaces. Patches, repairs, and alterations can then be mapped by the shadows or ghosts they cast. Photo: Travis C. McDonald, Jr. The first step in a thorough, systematic investigation is the examination of all surfaces. Surface investigation is sometimes called "surface mapping" since it entails a minute look at all the exterior and interior surfaces. The fourfold purpose of surface mapping is to observe every visible detail of design and construction; develop questions related to evidence and possible alterations; note structural or environmental problems; and help develop plans for any further investigation. 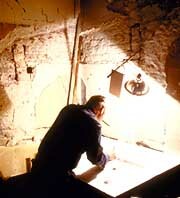 Following investigation, a set of documentary drawings and photographs is prepared which record or "map" the evidence. While relying upon senses of sight and touch, the most useful tool for examining surfaces is a high-powered, portable light used for illuminating dark spaces as well as for enhancing surface subtleties. Raking light at an angle on a flat surface is one of the most effective means of seeing evidence of attachments, repairs or alterations. The next level of investigation consists of probing beneath surfaces using non-destructive methods. Questions derived from the surface mapping examination and analysis will help determine which areas to probe. Investigators have perfected a number of tools and techniques which provide minimal damage to historic fabric. These include x-rays to penetrate surfaces in order to see nail types and joining details; boroscopes, fiber optics and small auto mechanic or dentists' mirrors to look inside of tight spaces; and ultra violet or infra-red lights to observe differences in materials and finishes. The most advanced technology combines the boroscope with video cameras using fiber optic illumination. In addition to the more common use of infra-red photography, similar non-destructive techniques used in archeological investigations include remote sensing and ground-penetrating radar. Small material samples of wood, plaster, mortar, or paint can also be taken for laboratory analysis at this stage of investigation. 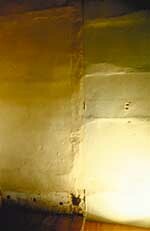 For instance, a surface examination of a plaster wall using a raking light may show clear evidence of patching which corresponds to a shelf design. Were the shelves original or a later addition? A small sample of plaster from the patched area is analyzed in the laboratory and matches plaster already dated to a third period of construction. 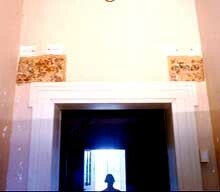 A probe further reveals an absence of first period plaster on the wall underneath. 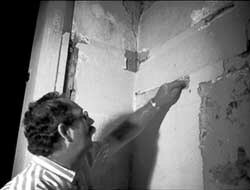 The investigator might conclude from this evidence that the shelves were an original feature and that the plaster fill dates their removal and patching to a third period of construction. Exploratory testing was used to verify the location of an abandoned fireplace. 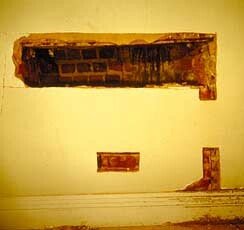 Plaster and brick were carefully documented and removed to determine the fireplace's type, size, and location. Photo: Travis C. McDonald, Jr. Most investigations require nothing more than historical research, surface examination and non-destructive testing. In very rare instances the investigation may require a sub-surface examination and the removal of fabric. Destructive testing should be carried out by a professional only after historical research and surface mapping have been fully accomplished and only after non-destructive testing has failed to produce the necessary information. Owners should be aware that the work is a form of demolition in which the physical record may be destroyed. Sub-surface examination begins with the most accessible spaces, such as retrofitted service and mechanical chases; loose or previously altered trim, ceilings or floor boards; and pieces of trim or hardware which can be easily removed and replaced. Non-destructive testing techniques do not damage historic fabric. If non-destructive techniques are not sufficient to resolve important questions, however, small "windows" can be opened in surface fabric at predetermined locations to see beneath the surface. This type of subsurface testing and removal is sometimes called "architectural archeology" because of its similarity to the more well-known process of trenching in archeology. 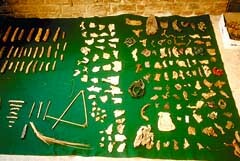 The analogy is apt because both forms of archeology use a method of destructive investigation. Photographs, video and drawings should record the before, during and after evidence when the removal of historic fabric is necessary. The selection and sequence of material to be removed requires careful study so that original extant fabric remains in situ if possible. If removed, original fabric should be carefully put back or labeled and stored. At least one documentary patch of each historic finish should be retained in situ for future research. Treatment and interpretation, no matter how accurate, are usually not final; treatment tends to be cyclical, like history, and documentation must be left for future generations, both on the wall and in the files. Laboratory analysis plays a scientific role in the more intuitive process of architectural investigation. One of the most commonly known laboratory procedures used in architectural investigation is that of historic paint analysis. The chronology and stratigraphy of applied layers can establish appropriate colors, finishes, designs or wall coverings. When conducted simultaneously with architectural investigation, the stratigraphy of finishes, like that of stratigraphic soils in archeology, helps determine the sequence of construction or alterations in a building. Preliminary findings from in situ examinations of painted finishes on walls or trim are common, but more accurate results come from extensive sampling and microscopic laboratory work using chemical analysis and standardized color notations. Consultants without the proper knowledge have been known to cause far more harm than good. Mortar and plaster analysis often provide a basis for dating construction with minimal intervention. Relatively small samples of the lime-based materials can be chemically separated into their component parts of sands and fines, which are then visually compared to equivalent parts of known or dated samples. A more thorough scientific approach may be used to accurately profile and compare samples of other materials through elemental analysis. Two similar methods in common use are Neutron Activation and Energy Dispersive Spectroscopy (EDS). Neutron Activation identifies the sample's trace elements by monitoring their response to neutron bombardment. EDS measures the response to electron bombardment through the use of an electron microscope. In both tests, the gathered information is plotted and matched with the reactions of known elements. The results provide a quantitative and qualitative profile of the sample's elemental components for use in further comparisons. Dendrochronology presents a minimally destructive process for dating wooden members. Also called tree ring dating, this process relies on the comparative wet and dry growth seasons of trees as seen in their rings via a core sample. This technique has two limitations: a very extensive data base must be compiled for climatic conditions over a long span of years and matched with corresponding tree ring samples; and the core samples can only be taken from timber which still has a bark edge. Simple identification of wood species during an investigation can be determined from small samples sent to a forest products laboratory. Evidence, questions, and hypotheses must be continually evaluated during investigation. Like a detective constructing a case, an investigator must sort out information to get at "the facts." Yet, are the "facts" conclusive at any time? Observations made during the surface mapping may identify random features. These features begin to form patterns; then, sets of patterns, perhaps representing alterations from multiple eras, begin to appear. If the right questions are not asked, the evidence can remain hidden. Hypotheses are formed, questioned, tested, re-formed and either rejected or substantiated. This process is repeated as more "facts" are uncovered and questions asked. Eventually the evidence seems conclusive. These conclusions, in turn, may lead to re-examination, more historical research, and the advice of specialized consultants. At some point, treatment generally follows based on the collective, educated conclusions of an entire professional team. The evidence collected during investigation, and any conclusions which can be drawn from it, should be documented in a written report. The complexity of a project dictates the complexity of the resulting record. It may be wise to maintain a report in an expandable format if long or extensive work is expected-additional evidence will undoubtedly need to be incorporated that alters previous conclusions. Reports tend to range from annotated photographs in loose-leaf binders to full-length bound "books." Putting findings and conclusions in an accessible form helps those who are planning treatment. For example, a rehabilitation project may require documentation to satisfy grant funding or tax credit program requirements; preservation and restoration projects always need careful documentation to guide the work. After work, the investigation report and notes on the treatment itself are made into a permanent file record. Whether or not work is being planned, the architectural investigation report will always be of value to future researchers or owners of the building. The most common professional document is called an Historic Structure Report. This invaluable tool for preservation typically contains historical as well as physical information. Sections include a history of the building, an architectural description of the original structure and changes made over time, the results of all investigations, a record of current conditions or problems, of past repairs and treatments, and recommendations for current and future action. They are seldom definitive; thus, research is a continuing process. Architectural investigation plays a critical role in making responsible decisions about treating and interpreting historic buildings. A successful project to research, inventory, document, and ultimately treat and interpret a building is directly linked to the knowledge and skills of architectural investigators and other historic preservation specialists. The expressed goal of historic preservation is to protect and preserve materials and features that convey the significant history of a place. Careful architectural investigation-together with historical research-provides a firm foundation for this goal. Travis C. McDonald, Jr., is an architectural historian who serves as the Director of Architectural Restoration at Thomas Jefferson's Poplar Forest near Lynchburg, Virginia. He respectively dedicates this work to three masters of architectural investigation: Henry A. Judd, former Chief Historical Architect of the National Park Service; Lee H. Nelson, former Chief, Preservation Assistance Division NPS; and Paul E. Buchanan, former Director of Architectural Research at the Colonial Williamsburg Foundation. The author gratefully acknowledges the following professionals for their help in reviewing this manuscript: Edward A. Chappell, Colonial Williamsburg; E. Blaine Cliver, Preservation Assistance Division NPS; Stanley O. Graves, National Conference of State Historic Preservation Officers; Bernard L. Herman, University of Delaware; H. Ward Jandl, Preservation Assistance Division NPS; Hugh C. Miller, Virginia State Historic Preservation Office; Orlando Ridout V, Maryland Historical Trust; William Seale; and professional staff members of the National Park Service. Timothy A. Buehner served as project coordinator and Kay D. Weeks served as project editor. Bullock, Orin M. Jr., The Restoration Manual . Norwalk, CT.: Silvermine Publishers, 1966. Burns, John A., editor. Recording Historic Structures . Washington, D.C.: The AIA Press, 1989. Howard, Hugh. How Old Is This House? . New York: Noonday Press, 1989. Howe, Barbara J., Dolores A. Fleming, Emory L. Kemp, and Ruth Ann Overbeck. Houses and Homes: Exploring Their History . Nashville, TN. : American Association for State and Local History, 1987. Judd, Henry A., Before Restoration Begins . Nashville, TN. : American Association for State and Local History, 1973. Kitchen, Judith L., Caring For Your Old House . Washington, D.C.: The Preservation Press, 1991. Seale, William, Recreating the Historic House Interior . Nashville, TN. : American Association for State and Local History, 1979. Secretary of the Interior's Standards for the Treatment of Historic Properties . Washington, D.C.: Preservation Assistance Division, National Park Service, U.S. Department of the Interior, 1992. Secretary of the Interior's Standards and Guidelines for Architectural and Engineering Documentation: HABS/HAER Standards. Washington, D.C.: HABS/HAER, National Park Service, U.S. Department of the Interior, 1990.